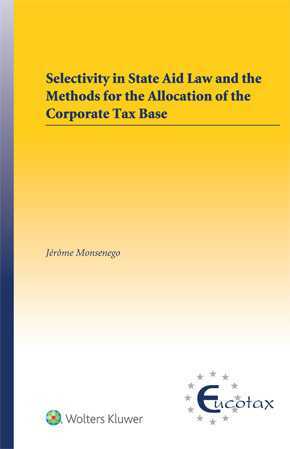 Selectivity in State Aid Law and the Methods for the Allocation of the Corporate Tax Base analyses the theoretical issues that arise when applying the selectivity test in State aid law to three methods for the allocation of the corporate tax base between the members of multinational enterprises. High-profile cases before the European Commission and the EU courts have indeed intensified scrutiny of the link between State aid law and the taxation of multinational enterprises. Certain decisions have raised questions about fiscal sovereignty and the interpretation of the rules on State aid – in particular the notion of selectivity – which have not been addressed in detail by the existing research. The combination of the evolution of the notion of selectivity in State aid law, on the one hand, and the need to adapt the rules for the taxation of the profits of multinational enterprises to the modern economy, on the other hand, makes it necessary to assess whether existing, as well as alternative rules for the allocation of the corporate tax base might entail a selective treatment. This research project is conducted at a theoretical level, without considering national provisions or particular tax treaties. The author suggests an analytical framework on the application of the selectivity test to the three allocation methods. It is concluded that these methods are likely to have certain selective features, with varying possibilities to be justified by the inner logic of a corporate income tax system. It is also demonstrated that selectivity occurs for different reasons, due to the different rationales of the three allocation methods. This well-researched book is intended at contributing to the academic literature on the impact of State aid law on the principles for the taxation of the income of multinational enterprises. The outcome of this research project is also relevant to lawmakers who need to reconcile the imperatives of State aid law with the design of rules that match their tax policies, and to judges or lawyers who apply the rules on State aid to tax provisions.